The Fluke 233 remote display digital multimeter allows you to be 30 ft away from the measurement point with the innovative wireless display. With the 233, you can perform two man jobs alone and remove the hazard from the job. Now you can work in two places at once. 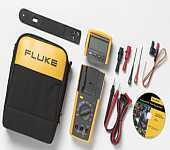 With the new Fluke 233 Wireless Remote Display Multimeter you dont need the help of another person when reading the display. Standing on ladders, tangling long test leads, or calling on a second person while testing are all now a thing of the past. Measure safely while placing the meter in hazardous areas, in clean rooms or near moving machinery. The Fluke 233 is a tool that will make your job easier.